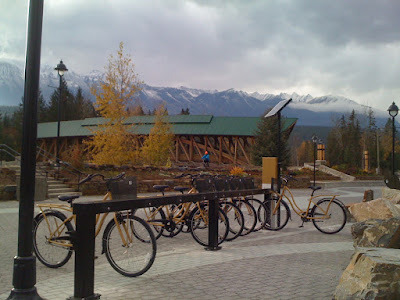 The town of Golden, British Columbia has shown the world that small towns can join the bike-sharing world without multimillion-dollar investments. Two years ago, the Golden Active Transportation Committee met with the intention of setting up a bike-share “that would work well with our community,” said Lisa Reinders, manager of leisure services in Golden. This past March 27th, their dream was realized. The two hubs are located at a campground and a hostel, where the staff of these businesses sign up users, sell swipe card passes, and keep the stations clean. In return, the businesses retain 75% of the rental fees they sell, while the other 25% goes to the Town of Golden, the operator. 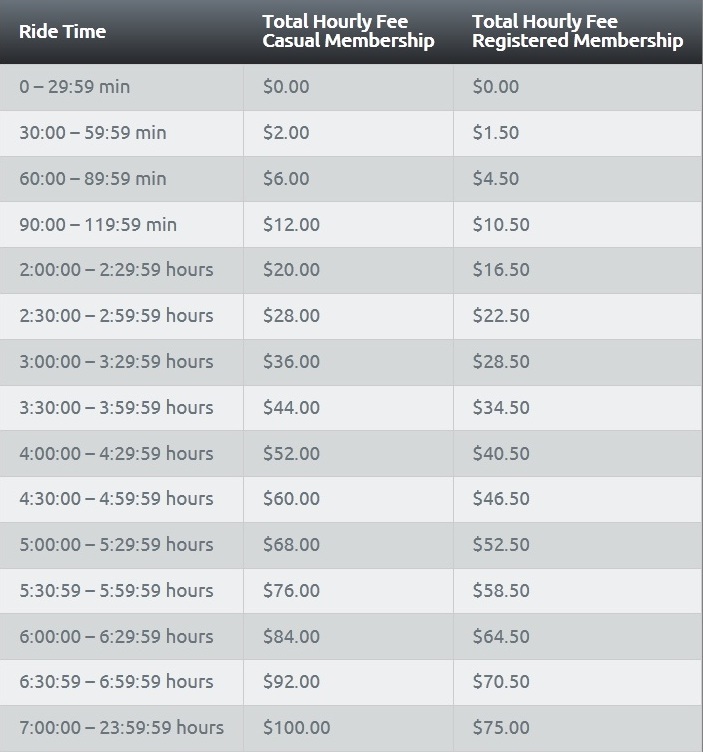 The rental fees are $10/day, $35/month, and $60/season, which runs from May to October. A new user can sign a waiver at the campground or hostel, and after paying, can obtain a swipe card to check out a bike for up to 30 minutes at a time. The hubs, which are powered by solar panels, were purchased by the Town of Golden from Sandvault, a bike-share vendor. The cost of the stations, including 15 Kona bicycles and software maintenance, came to $37,500, or $2,500/bike. To finance this investment, Golden benefited from British Columbia’s Resort Municipality Initiative, where 13 resort communities receive a portion of the town's hotel room tax to invest in local projects. As the staff of the campground and hostel do most of the operational labor, the town of Golden only needs to offer two part time employees to provide oversight, maintenance, and occasional technical support for the program. The town plans to add 15 more bicycles and two more stations in a subsequent phase of the program. Golden's model provides an intriguing example for smaller towns that want to offer bike-sharing without undertaking large capital investments. As New York City began rolling out extensive bike lanes this spring, John Cassidy of The New Yorker raised staunch opposition, suggesting that the point has been reached where the additional costs of bike lanes to motorists and pedestrians are greater than the benefits they provide to cyclists. The Economist promptly published an article addressing the economic fallacies of Cassidy’s crusade, delineating the dramatic externalities of urban auto use, including respiratory damage from auto-generated ozone, climate changing carbon dioxide, road breakdown, and congestion, not to mention accident fatalities and obesity. As fuel taxes are too low to cover road maintenance, let alone the rest of these externalities, none of which bicycles exhibit, New York would be better off encouraging fewer cars and more bicycles, The Economist argues. Nancy Folbre, of UMASS Amherst, takes her economic analysis a step further, positing a concept of “The Bicycle Dividend.” She turns the traditional economic concept of demand stimulating supply on its head, showing that increased supply of bike lanes encourages more cyclists, which makes cycling safer, which in turn attracts more cyclists, which begins to shift cultural perspectives on cycling, which in turn attracts more cyclists, which encourages businesses to offer showers and other resources for their bike- commuting employees, which in turn attracts more cyclists, etc. This virtuous cycle, while taking time to evolve, can be spurred by increased supply of bike infrastructure. Finally, she quotes a study by her colleague showing that each dollar spent on bike paths creates more jobs than each dollar spent on roads, in addition to providing more public welfare. 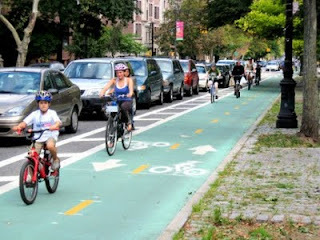 Discouragingly, Armin Rosen of Alt Transport published a reaction to Folbre’s article arguing that drivers won’t necessarily stop driving because bike lanes have increased. Rosen concludes, “There is a ’biking dividend’—but it might have more to do with a city’s prestige and reputation, as well as its local biking economy, than with any unproven ability to take cars off the road.” This reveals Rosen’s greatest blunder, as he fails to recognize the connectedness of a city’s reputation, biking economy, and car concentration. As Folbre’s virtuous cycle illustrates, the three build off each other, so if a city would benefit from fewer cars, as The Economist suggests New York would, then it would do well to invest in bike infrastructure. This, in turn, will increase bike commuters, resources for bike commuters, and begin to change pervasive cultural attitudes towards bikes. Further, a NICHES report showed 7% of people who use Lyon’s Velo’v bike-share would have driven a car if the program did not exist, showing that enhanced infrastructure does take cars off the road. This issue lies at the crux of city planning, and Cassidy’s accusation of “the bike lobby’s effort to poach on our territory” lays bare his belief that the streets, the majority of most cities’ public space, belongs to drivers, and any reconfiguration of this historical precedent is an affront to their rights. Fortunately, we are now afforded the hindsight to see that basing our transportation system on cars is hurting our bodies and our environment, in more ways than one. After all, here we aren’t just talking about public transportation, but what kind of transportation we, as a public, wish to incentivize. It’s time for our leaders to make public space work for our best interests as a public, not just for the best interests of drivers. The dramatic proliferation of bike-sharing services across the world, and the necessary bike infrastructure to serve bike transit riders, reveals a change of course. The expansion of public space afforded to cyclists will only facilitate the social and infrastructural change necessary needed to make cycling a viable urban transportation option, and make our cities better places to live.